inward for both positive and negative charges. outward for both positive and negative charges. inward for other positive charges and outward for other negative charges. outward for other positive charges and inward for other negative charges. This is College Physics Answers with Shaun Dychko. This question asks us for the direction of the electric field of a negative charge. The direction is always inwards because you define electric field direction based on the direction of a force that would occur on a positive test charge. So if we placed a positive test charge here what would the direction of force be on it? Well the direction would be towards the negative charge because they are oppositely charged and they attract. So that is the direction of the electric field. The wording is a little bit strange in these options here. 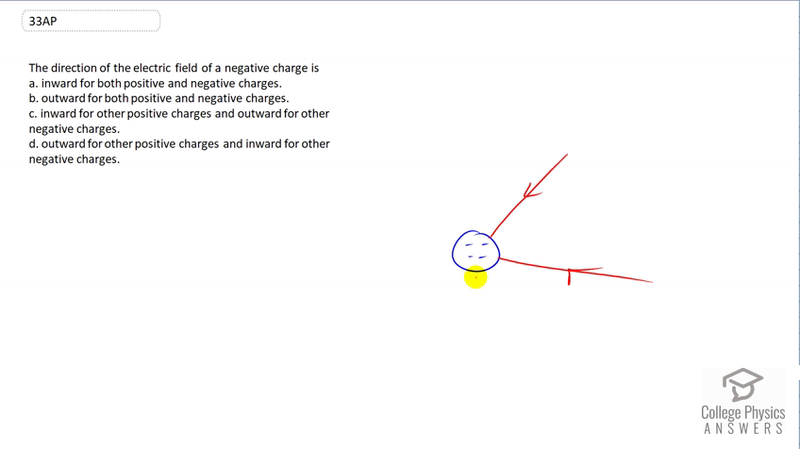 What it's saying is suppose you put a positive or negative test charge around this negative charge, what would the direction of the electric field be of the negative charge? Whatever charge you place around it has no effect. So if you put a negative charge here the electric field of this charge that we're interested in is still towards it. Nevertheless, there will be a repulsion force certainly, because they're the same sign. They're both negative. But that's how it works and so this electric field points in the opposite direction to force that would be applied on a negative test charge. So the answer is A.